Within 96 hours the Islamic State of Iraq and the Levant (ISIL) or the Islamic State of Iraq and the Sahel (ISIS) or the Islamic State of Iraq and Syria, depending on who you are talking to, went from being an active player in Syria and controlling Fallujah and Ramadi to taking over Mosul, Tikrit and moving on Samara which is only 68km from Baghdad. While doing all this they’ve continued to take the fight to the Syrian Army and launch multiple IED attacks both in Baghdad and in the Basra area. So how did it happen and why is it happening now? Perhaps a brief recap is in order. In 2008 as part of his farewell tour of Iraq (the shoe throwing tour) President GW Bush signed an agreement with Prime Minister Maliki that laid the foundation for a long-term military relationship between the two nations. It was a precursor to a full Status of Forces Agreement (SOFA) which is the document that lays out the laws and rules under which foreign forces will operate in a host country. President Bush was clear at the time in stating that be didn’t believe he should sign a full SOFA agreement considering the impact it would have on the next President (considering the campaign rhetoric of then Senator Obama) President Bush was very wrong in his thinking. The interim agreement laid out the path to end combat operations, withdraw US troops from major cities, laid out a timetable for turning over security responsibility in the various provinces and set out the final concept of a residual force that would exist beyond 2011. That force would provide training to the Iraqi Forces, provide unique counter-terrorism skills, intelligence, communications, and provide certain air assets like medical evacuation and close air support until the Iraqi Air Force was sufficiently mature to take over those tasks. Enter President Obama in 2009 after campaigning on the platform that the Iraq war was bad and a war of choice that should never have begun and would end during his first term. That was an easy promise to keep since the agreement signed by President GW Bush said all US troops would be out of Iraq no later than 31 December 2011 unless a full SOFA agreement was in place. President Obama while taking credit for ending the war simply let the agreement Bush signed expire although to give him some credit he did pretend to negotiate a SOFA agreement for about a year before announcing that an agreement couldn’t be reached. He also ended the war a couple of months ahead of time so he could claim it was his timetable and not the Bush administration timetable that was followed. It should have seemed obvious in 2009 that a SOFA was never going to get signed with the election of President Obama. Obama’s base needed a quick win and apparently Gitmo wasn’t going to be it so Iraq was the win he gave them. Most of us just couldn’t believe that after the Obama administration put so much effort into forcing PM Maliki into the compromise coalition government that led to him remaining PM even though he and his party finished second in overall voting that he would walk away from it all. Clearly they had to understand the fragile nature of the coalition government and the reality that the only leverage the US government had was based on the presence of the US military. So what began happening in early 2011 when negotiations broke down, PM Maliki the survivor rediscovered his Shia roots. No longer would he be remembered as the guy who personally commanded the final assaults on the Shia militia’s in Basra or put a warrant out for the arrest of the rogue Shia leader Muqtada al -Sadr. No now he was the best friend Iran could ever hope to have. Al-Sadr returned and his black and dark green flags became the dominate flag in Southern Iraq. Meanwhile the Kurds saw this and the efforts of Maliki to use his power to oust Sunni Ministers and even go as far as having them arrested on trumped up charges and they dug in. In fact one could easily see that President Obama’s lead representative on the Iraq file Vice President Joe Biden was seeing his foreign policy dream of an Iraq separated into three regions come true. Was he guiding the President to vindicate his heavily criticized position on Iraq and set himself up for the 2016 Presidential elections? Hard to say but his predictions began to slowly materialize but not because it was the right thing for Iraq or for US foreign policy but simply because of the survivor nature of the various leaders in Iraq. Maliki turned to Iran for support, the Kurds began to heal the wounds with Turkey and the Sunni’s began to hunker down in their strong holds. The fuse was finally lit in mid-2012 when PM Maliki made a dramatic change to the Sons of Iraq program. This program instituted as part of the Surge strategy essentially paid for 40,000 armed Sunni’s who agreed to turn against al-Qaeda in Iraq or AQI (the precursor to ISIL or ISIS). Maliki cut the Sons of Iraq in half agreeing to only fund 20,000 and for those 20,000 he cut their salaries by 40%. The result was as predictable as the sun coming up in the East. 20,000 men with weapons, years of combat experience and a chip on their shoulder were now available for rent, while 20,000 of their brothers still charged with keeping the peace in Anbar were 40% less motivated to risk their lives to go after AQI. AQI had its safe haven again, and were bolstered with thousands of recruits and like the predictability of the sun setting in the West, the waves of bombing campaigns against primarily Shia targets began anew. The death toll in 2013 almost equaled the levels of 2007 at the height of the sectarian war. One can hardly blame the west for not realizing it, since CNN and the other mainstream media outlets had long since moved on. 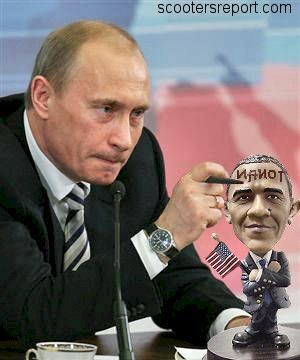 President Obama said the war was over the mainstream media said right-o. And at the Presidents brief press conference that followed on Friday in front of Marine One before heading off to some fundraisers and a tee off time in Palm Springs boiled down to; you screwed up and we’re not coming to help anytime soon although we might consider helping but don’t count on it. It very much reminded me of a statement made some months ago on Syria which boiled down to; I think we should bomb you into the stone age but I’m pretty sure Democrats in Congress won’t support me and the Brits aren’t willing to help out so I’m going to punt the decision to Congress to decide. Like now the President then went to play golf at Andrews Air Force base with VP Biden in tow. I’m not sure what it is about punting before golfing but it’s becoming a habit. On the ground we have witnessed ISIS/L continue to their southward movement all the while taking town after town in Diyala province. We have also seen the entry of the elite Iranian Republican Guard units who moved to Samarra to protect the Shia Shrine known as the al-Askarai Mosque which was bombed by AQI in 2006 touching off the sectarian violence that killed thousands on both sides. Worse yet the even more elite Quds Force (Iranian Special Forces) have been joining Iraqi Army units to provide advice and to help better coordinate the defensive efforts against the ISIS/L. I’m sure Joe Biden is jumping for joy and wondering when CNN will call to do that congratulatory interview about his prophecies on Iraq segregation coming true. We now seem to have a stalemate in the Samarra area with the Sunni’s holding several Western and Northern provinces, the Kurds securing their boarders with Peshmerga fighters (the best on the battlefield by far and away) and the Shia firming up their hold on everything from Baghdad to Basra. So what’s next you ask…well we have a much stronger Iran, who may even be willing to go further and support Maliki’s efforts to retake Tikrit and Mosul if not Ramadi and Fallujah, although these last two may be a bridge too far. We see Iran’s Syria strategy of using Hezbollah and the Quds Force to bolster the Syrian Army working. Prior to the entry of Hezbollah and the Quds Force the Syrian Army was losing battle after battle, city after city. Now it’s a stalemate at best with a slight edge to the Syrians and their allies. We also see the Gulf States in tatters with Saudi Arabia, Qatar, Kuwait and Jordan all at odds with each other over who to support and how to turn back this Shite surge. Turkey’s strategy has also been thrown off with this latest effort although they will benefit in the short term as Baghdad’s anger over Kurdish oil exports via Turkey which last week were the top issue for Maliki are currently put aside. The support of the Peshmerga most likely came at the cost of future oil exports not being a concern for Baghdad should Maliki survive. With Egypt (the largest Sunni country by population) on the sidelines, the GCC bickering and Iran, Syria, Iraq and Hamas in the oddest alliance ever, we are witnessing the change in the map that hasn’t been witnessed since the breakup of the Soviet Union and Yugoslavia in the early 90’s. How this ends is anybody’s guess at this point but one thing is for sure, those who died or were wounded in Iraq from 2003-2011 did so in vain thanks to President Obama and Vice President Biden’s desire to pretend that eight years is enough time to put aside hundreds of years of animosity because they say so. The US spent decades propping up, cajoling and threatening the various governments in Japan, Germany and South Korea so they could develop into western liberal democracies and trusted allies to the west but couldn’t seem to give Iraq that same opportunity and most likely won’t give Afghanistan (the good war) that opportunity either. As a veteran I never thought I’d ever write that soldiers ever died in vain…it’s stunning to see the words on the screen, but this is what has happened. 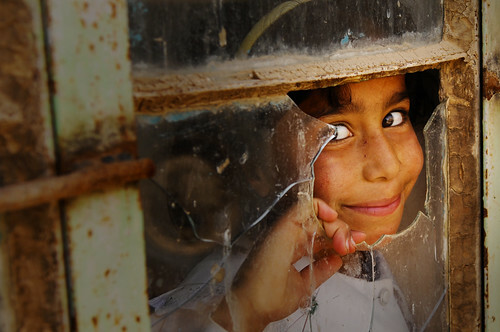 iraq (Photo credit: The U.S. Army) Girl looking through a broken classroom window.